The Gion festival begins July 1st and lasts until July 31st. There are many street vendors with games and Japanese festival food during the Gion Festival. Many people go to this Japanese festival wearing traditional Japanese outfits yukata and geta. Kyoto is the ancient capital of Japan. Gion was the old name of Yasaka shrine. Gion festival is one of the biggest festivals in Japan. First celebrated in 896, the Gion Festival has grown through the centuries into a celebration that fills Kyoto with color, music and merriment. 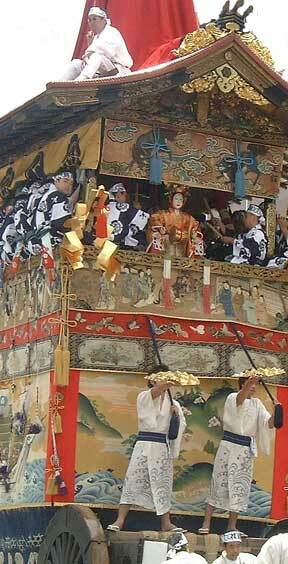 The highlight of the festival is the Yamahoko-junko -- a parade of colorful floats through downtown Kyoto. The gigantic floats are pulled through the streets by teams of men dressed in traditional costumes; many of the floats even have musicians on board. The whole city is decorated for the festival, the streets are lit up with laterns and the floats are covered with colorful, beautifully patterned fabrics. We have several tours that bring you to Kyoto to attend the Gion Festival, enjoy the parade and see the city decorated for the festival.